I give up trying to figure this series out. So, honestly speaking? 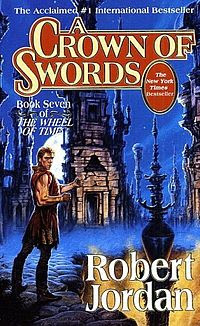 A Crown of Swords is, by far, my favorite book in this series so far. Everything clicks really well, the book's pace is finally in line with what's happening, and, while it feels like a middle book in a long series, it works because what happens feels like it matters. Where so many multi-book fantasy stories become elaborate chess matches, the Wheel of Time is no different in that case, except that so much of it ends up either focusing on the pawns or watching the same four pieces go back and forth repeatedly. In this book, at least, we get clear action from Rand, we get significant movement from the Aes Sedai, we actually get to feel some danger for the first time ever, it just works. This is where the flaw in this series comes into play, though. So much of the Wheel of Time is based around missed potential. I feel as if I'm praising this book not because it was a good read, but because I feel like I should be applauding Robert Jordan for not screwing this one up. It's just as much a testament to the misses as it is the hits. Reading this book truly got me interested in the series again, and that's something. I'm hitting the back end of the Jordan-penned tomes, and while I'm hoping I don't fall behind due to work duties, I'm interested to see if this keeps up. But I'm suddenly glad I haven't thrown in the towel just yet. Review: Sideshow Boba Fett 1/6th Scale Figure! Pre-Order Hot Toys Hulk 1/6th Scale Figure! Opening Tonight: Crazy 4 Cult New York! Let's Play Tera Part 2: Puggypants Unleashed! Internet Explorer on a Mac? That's Wack! Pre-Order 1/6th Scale Amy Pond! Let's Play Tera Part 1: Puggypants! Lego Lord of the Rings Exclusive Bonus Figure!